Mustela Sun Protection Face & Body Spray SPF 50 200ml. 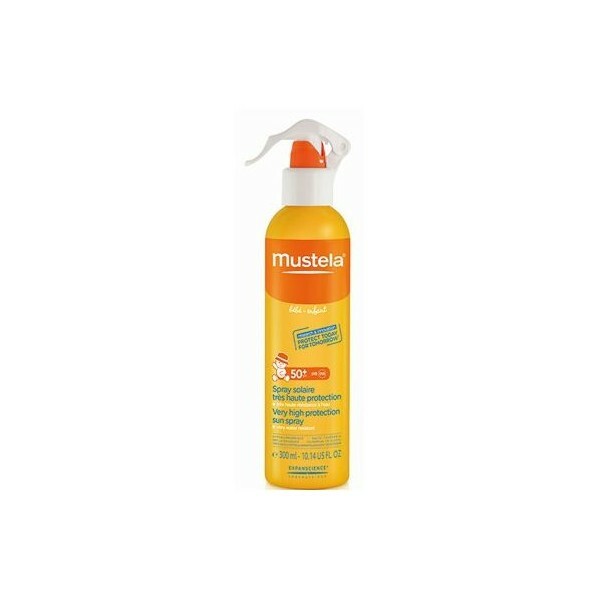 Mustela Sun Spray Very high protection for infants and children. Sunscreen Mustela is the favorite breast size format in savings for many applications for face and body. Solar spray very high protection Mustela has been specifically formulated to protect the fragile skin of babies and children from the risks related to the sun. It can be used to give birth and atopic. Its smooth and creamy texture allows it to extend the skin easily and leaves no sticky feeling after application. It is highly resistant to water, perspiration and rub with the towel or clothing. Solar Spray SPF50 of UVB protection ensures Mustela (SPF 50+ index) and UVA (25PPD). 86% of ingredients are of natural origin. The avocado perséose cell capital preserves the skin and provides cell protection. The filter system is 100% organo with Tinosorb S and Titanium Dioxide natural and without nanoparticles. Provides efficacy / tolerance ratio without recognized allergenic optimal organic filters (octocrylene, cinnamate, ...) unscented and alcohol. It ensures high tolerance from birth. Using spray sunscreen high mustela? Apply a generous amount about 20 minutes before sun exposure on face and body, renew the application every two hours or after swimming. Remember that children under 3 years direct sunlight is not recommended, if you follow these same guidelines is inevitable. Important: insufficient application reduces the level of protection. Ingredients: Aqua (Water), Coco-Caprylate / Caprate, Caprylic / Capric Triglyceride, Dicaprylyl Carbonate, Glycerin, Diethylamino Hydroxybenzoyl Hexyl Benzoate, Lauryl Glucoside, Polyglyceryl-2 Dipolyhydroxystearate, Ethylhexyl Triazone, Persea Gratissima (Avocado) Oil, Phenylbenzimidazole Sulfonic Acid, Titanium Dioxide, Bis-Ethylhexyloxyphenol Methoxyphenyl Triazine, Pentylene Glycol, Potassium Cetyl Phosphate, Stearalkonium Hectorite, Tocopherol, Glyceryl Caprylate, Sodium Hydroxide, Dehydroacetic Acid, Alumina, Xanthan Gum, Jojoba Esters, Propylene Carbonate, Persea Gratissima (Avocado) Fruit Extract.